In a bowl take fish pieces (250g), apply red chili powder (2sp), turmeric powder (1/2sp) and keep it aside for some time. Heat the oil (2sp) in a pan; add fenugreek seeds (menthulu) (1/2sp), chopped ginger (1 sp) and fry them. Add fish pieces to it and fry for few minutes, then add ground paste of coconut (150g), green chilies (2sp), tomatoes (1/2 cup) and salt (to taste). Add water as needed. Let it boil at high temperature. When the fish gets cooked and curry boils up, add soaked kudampuli (1sp), then lower the flame and add curry leaves (1sp) to the curry. 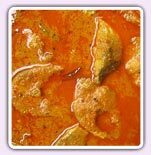 Now fish curry with coconut is ready to serve.